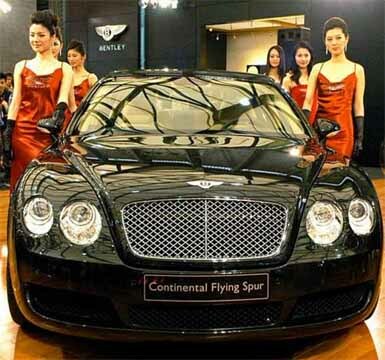 (ObserveChina) Who bought the Ten Million Yuan Bentley? Yu Jie. [in translation] The Bentley is the car for British royalty, and the company has just found out that China is its most rapidly growing market. According to the general manager of Bentley China: "Bentley China has only been in China for a very short while. In a period of 18 months, we sold 82 Bentley cars, priced from 3.68 million yuan to more than 10 million yuan. That growth rate is rarely seen in the global market and has exceeded initial expectations by far." Upon information, the sales of Bentley cars in China has been exceptional. Among the more than 150 Bentley distributors around the world, Bentley China was first in many categories: first, number one growth rate in the world; two, the first to sell the Bentley Arnage 728 model; third, the world leader in the elongated Bentley Arnage 728 sedan. Bentley Beijing also holds the record for selling the elongated Bentley limousines. At the present, Bentley has more than 180 cars in China. Bentley is optimistic about the Chinese market. In the Asia-Pacific region, mainland China is more important than Japan, Taiwan and Hong Kong. "The Chinese economy has been booming in recent years, creating large numbers of young and rich people. This new elite is paying attention to their standings in economic activities." According to Beijing Entertainment News, on the first day of the Beijing International Auto Show on June 6, 2003, "seven rich men bought expensive Bentleys." By June 10, the 8.88 million yuan Bentley sedan was sold. Soon, Bentley China set up a showroom to sell the 4.8 million yuan and 8.88 million yuan models. Within two months, more than twenty had been sold worth more than 100 million yuan. The market for top-end automobiles in Beijing surprised the distributor. "Who bought them?" The Bentley workers were asked countless number of times, but they do not reply. "It's the people who are richer than rich people," said a professional. "But you won't know who they are!" The hot-selling Bentleys revealed a corner of the iceberg of the super-rich class in China. In the United States, no rich person can hide outside the sight of the public and the media. Bill Gates, the Wal-Mart heirs and the Rockefellers face a rigorous and complete tax system. They must report and pay their taxes regularly. The sources of their income are clearly listed, and their lives are watched over carefully by the media. In China, the comparable super-rich people are as invisible as those Bentley owners. Nobody seems to know where their wealth comes from. Some scholars estimate that there must be about 100,000 super-rich people in China. Although one cannot say that they are all like Yang Bin who almost became the Chief Executive of the Sinuiju province of North Korea or Shanghai real-estate tycoon Zhou Zhengyi, many of them made their fortunes in ways that are similar to Yang and Zhou. While one cannot say that every cent that they earn is illicit, a large chunk of that "invisible wealth" cannot be brought out in daylight. They can use 1 million yuan bribe to procure a 100 million yuan plot of land; they can use 1 million yuan to purchase a factory worth 100 million yuan; they pay no taxes; and they don't take part in charity events. They are not government bureaucrats, but they can pick up the telephone and ask the provincial chief over for dinner. They are not foreigners, but they have multiple foreign passports. According to the National Statistics Bureau, the national personal income for rural residents is 2,434 yuan last year. For the Bentley (ignoring taxes, insurance and maintenance), the sales price alone is equal to 3,648 years of average rural personal income. What kind of concept of time is 3,648 years? This is equivalent to a peasant working without eating or drinking from the Xiang Dynasty, through the slavery era and the feudal era, to the end of the "early stage of socialism" Even the richest townspeople in Guangdong province -- with annual income of around 10,000 yuan -- would have to work without eating or drinking more than 800 years to buy a Bentley. But for the super-rich, the money comes too easy; banks are like their personal money-printer and they enjoy their wealth in ways that are more relaxed than oil princes in the Gulf nations. They also have to compete for those expensive Bentleys because the number of super-rich people is far larger than the number of imported Bentleys. China has become the world's richest nation of Bentleys. Apart from the "long history and vast geography" of our motherland, we have something else to be proud of -- in a few years, the number of Bentleys in China will be another Guinness record. All the clothing and shoes of the villagers were torn and ragged. The people looked tiny and thin. They looked dull, without any hope. When the photographer took their photos, they stood there like zombies for you. The worst part was that I found that the people lived here with their animals in small spaces, but it seems that the animals were more valuable. Each family earns less than 300 yuan per year, much lower than the poverty line defined by the government. About this, Zhang Baohua who grew up in the relatively rich Hong Kong sighed: "I cannot help but wonder why even as the country developed economically, the peasants are not receiving any benefits? Today, Shanghai can claim to be one of the most modernized and developed cities of the world. Yet nobody cares about the happiness or pain of these peasants and their children ... When people's lives are worth less than those of pigs or dogs, when people's existence has no value, what hope is there for society?" I am from Sichuan province. I have been to many places in Sichuan, but I have never been to the Liangshan Yi Autonomous Area. I have been to many poor areas in the southwest and northwest, but I have not yet seen people as poor as Zhang Baohua wrote about. As an intellectual who cares about the ups and downs of society, I express my respects to Ms. Zhang while feeling a deep sense of shame and pain at the same time. Does the future of China depend on dozens or even hundreds of Bentleys? Is there an inevitable connection between the wealth of the Bentley owners and the poverty of the Yi mountain villagers? This requires economists to answer. Unfortunately, most economists work on behalf of the government and businesses these days. Although I am not an economist by training, I know that I won't be proud of China becoming the Nation of Bentleys. I know that a society that rewards illicit methods, a society that takes away from the poor to give to the rich and a society in which thugs rule and are admired cannot remain stable forever, and there will never be harmony, justice and the rule of law. [in translation] I didn't know too much about poor families in China. I have seen them in television news documentaries. I have heard about them from the Chinese government. I remember that in 2002, I was covering the National People's Congress. In a small group meeting for Hubei province, I heard then-vice premier Wen Jiabao say: "I met an old peasant man. He told me that his family was so impoverished that he even had to sell the plank of wood that he wanted for his coffin. As I listened, I thought to myself: Our task in helping the poor is immense." Four months after hearing those words, I finally had the chance to personally experience just how immense and difficult was the task that Wen Jiabao described as immense and difficult. Last July, I traveled with members of the Hong Kong Salvation Army to Liangshan in Sichuan province. We had to take two inland air flights and then travel by car for 9 hours before we arrive at a place known as Meikou county. This is the largest Yi Tribe Autonomous Region in the country. Most of the residents are illiterate. They live up a mountain at more than 2,300 meters in altitude. As far as the eyes can see, there are rice fields built on steps up the mountain side. The houses are built from mud There is only one tiny hospital and that was donated by the Salvation Army. The medical equipment is elementary. The rooms are dark. The so-called sick bed is just a plank of wood. For people here, though, they were already incredibly grateful about it. There are usually no visitors from the outside. When our interviewing team got here, we were treated like VIP's. They brought out their best food -- potatoes, corn and chicken to treat us. It was very cold that night. It was four degrees below zero. But most of the people there only have one piece of light clothing. Next morning, before it even got light outside, we set off uphill in jeeps. What I saw shocked me. At about five am, on a faraway hillside, I saw a row of children wearing black capes walking on a mountain path not more than 2 meters wide. I asked the locals about the children, and they said that the children were going to school. At five am in the morning. The children were going to school! The locals also told us that these children will have to walk more than four hours before they arrive there. In the evening, they have to walk another four hours to come home. Day after day. Year after year. This is how the children here attend school. For the longest time, we thought that such conditions can only be seen in movies. After I saw it with my own eyes today, then I understood the importance of "seeking an education" for the children in these impoverished mountainous areas. The Chinese government had been calling to assist the poor non-stop, and I finally recognized today the seriousness of this problem. The outsiders call these children wearing black capes "crows", because the groups of black capes look like "crows." I felt bad to think that these lively and spirited children ought to described as birds of ill-omen. When it began to get bright, we arrived at the village up the mountain. There were feces from pigs and sheep everywhere. It was even colder than the place where we had stayed the night. All the clothing and shoes of the villagers were torn and ragged. The people looked tiny and thin. They looked dull, without any hope. When the photographer took their photos, they stood there like zombies for them. The worst part was that I found that the people lived with their animals in small spaces, but it seems that the animals were more valuable. Each family earns less than 300 yuan per year, much lower than the poverty line defined by the government. How do they live on 300 yuan? "Our family makes only 200 yuan a year. I don't have anything to eat for several months of the year, and we have to rely on assistance from the government and others," a Yi tribe woman told me. There is no fertile land by the mountain. They live by rearing animals. Many of the people do not own any cows or sheep. Fortunately, the local Red Cross and Salvation Army bought cows and sheep for them and then they have some way of making a living and survive. I cannot help but wonder why even as the country developed economically, the peasants are not receiving any benefits? Today, Shanghai can claim to be one of the most modernized and developed cities of the world. Yet nobody cares about the happiness or pain of these peasants and their children. "Our government spends more than more than 100 million yuan each year to assist the poor, but it is not enough. Even if we spend 100 million yuan, we have 1 million people here and each person will get only 80 to 90 yuan per year," a Liangshan government worker told the interviewing team. I think that in order to really help the peasants rise out of poverty, they must be given the opportunity -- the opportunity to get an education, the opportunity to improve their lives and the opportunity for large-scale economic development. Then they will become self-sufficient and they will have the knowledge to leave the peasant villages ... Otherwise, the poverty will be passed along from one generation to the next. When people's lives are worth less than those of pigs or dogs and people's existence has no value, what hope is there for society? In a press conference, Premier Wen Jiabao repeated again and again that the peasant problem must be solved. Within the Chinese population, the peasants account for the majority and they need help. If the peasant villages do not develop, any hope for China is tiny. Nobody expects that every place in China will look like Shanghai, but at the very least, those who live on this warm earth should stay warm and eat enough. Undoubtedly, solving the problem needs other forces than the government's efforts. For a vast and populous country such as China, there are some limitations about what the government can do. There are many things that they have no time or the ability to do. Thus, China needs help from non-government aid organizations more so that many other countries of the world. There are various non-government organizations around the world, such as Doctors Without Borders, Red Cross and so on. Although many of these organizations are working in mainland China, the politically wary Chinese government will only permit these organizations to provide services but not to allow them to register legally or to recruit members. The government has this fear that these organizations will grow gradually until they snowball to the point where they affect the power of the government or even political stability itself. Even the volunteer help organizations of China itself have neither independence nor financial support. Besides, they are government workers. Each time when there is a disaster, they should be doing their work as quickly as possible. Instead, they had to report to the government first. Then the government sends people to investigate and then decide to allocate funds. So there is a delay. I think the Chinese government worries too much. Would a powerful and popular government worry about these organizations that provide good-willed aid? Besides, the government itself has limited resources and society do need the help of these organizations, except the conservative viewpoints have stifled these ideas and placed these non-government organizations in a legal limbo of non-existence. These organizations acted out of kindness, and they need millions if not tens of millions of dollars to operate. Who is going to make those kinds of huge investments on "non-legal" organizations that are not recognized by the local governments?